The P-40 was an evolutionary development from the Curtiss drawing boards which started with the Model 75. Curtiss' Model 75 created the basic wing and fuselage that would distinguish this unique family, but equipped with a radial engine, this prototype would lead to the earlier P-36 Hawk. As engine technology continued, an Allison V1710 liquid-cooled engine was mounted on the firewall, and the resulting streamlined cowling led to the now-familiar P-40 silhouette. The P-40B was armed with two 50 caliber machine guns in the nose and four 30 caliber machine guns in the wing (the previous P-40 versions were armed with two 50s and two 30s). The P-40B also featured improved radio equipment over its predecessors. A number of P-40Bs were deployed around the world by the time the Japanese attack on Pearl Harbor brought the United States into the war. Two of these aircraft managed to get airborne in the midst of that attack and were credited with four kills. 110 P-40Bs were delivered to the RAF as Tomahawk IIAs. The major deficiency in this aircraft was the lack of self-sealing fuel tanks which would be corrected in the P-40C/Tomahawk IIB. It would be these later versions that would ultimately equip the American Volunteer Group, better known as the Flying Tigers. 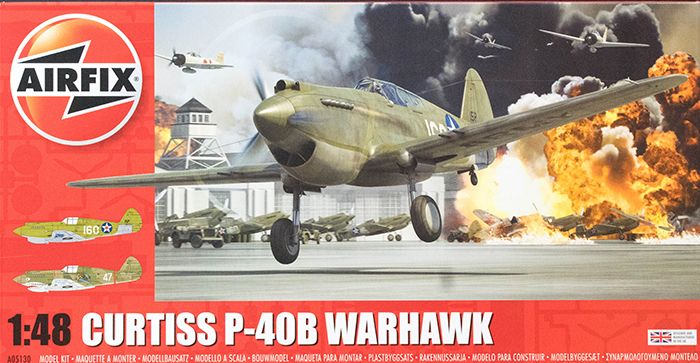 Airfix has developed an all new-tooled kit of the Curtiss P-40B Warhawk. For whatever reason, there have been a number of kits produced of this subject and very few of them didn't have some serious issues. The most common design error with this subject is the assumption that the cockpit had a 'floor' when in fact the bottom of the cockpit was the upper surface of the wing. This reinforced section was curved with the top of the wing and had the rudder pedal pivot, control yoke mount, and other elements designed into that wing upper surface. Rather than listing all of the companies that got this wrong, let's just say that Airfix got it right. The instructions have you open two 2mm holes along the wing bottom centerline where an external tank would mount. The kit does include a centerline tank but it is not mentioned in the instructions. You'll also need a set of aftermarket pilot restraints for the cockpit. Speaking of instructions, Airfix has a nice system for producing instructions. Using their CAD images to illustrate assembly, they leave the unaffected portions of the model in gray while highlighting the parts being added in red. Nice. The decals are nicely done and include a set of airframe stenciling. We've been long overdue for a proper kit of this aircraft and aside from the minor points above, this is easily the best injection-molded kit of the early P-40 in any scale to date.